Justin Weinrich is a respected trial attorney with years of success representing his injured clients in personal injury cases. Justin’s entire practice is dedicated to holding insurance companies and negligent drivers responsible for the injuries they cause his clients. Over his seven years in practice, Justin has obtained millions of dollars in settlements and jury verdicts on behalf of his clients. Justin began his legal career in 2005, working as a summer law clerk at a small St. Louis law firm. In 2007, Justin was given a rare opportunity for a first-year law student, as he began working for a boutique St. Louis law firm that focused its practice almost entirely on litigation. After seeing his work ethic and tenacity, the firm hired Justin as an associate attorney immediately upon his graduation from law school in 2009. In 2011, after just two years in practice, Justin became a partner in the firm, and moved to Chicago to open the firm’s Chicago office. 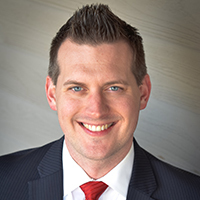 In April 2013, just before his 30th birthday, Justin broke away and founded The Weinrich Law Firm LLC, focusing his practice exclusively on representing Chicago-area personal injury clients. Justin is an active member of the American Association for Justice, the Illinois Trial Lawyers Association and the Chicago Bar Association. Unlike many other personal injury law firms, Justin’s firm does not advertise. Instead, The Weinrich Law Firm’s foundation is built on strong referral relationships with dozens of law firms throughout the greater Chicago area and referrals from many satisfied former clients. Just 2.5% of Illinois attorneys are recognized with the “SuperLawyer Rising Star” distinction, a private rating system that takes into account trial skills, peer reviews and a lawyer’s reputation in the legal community. Justin was named an Illinois SuperLawyer Rising Star in 2015, 2016 and 2017.